Jorge Santiago Jacinto, being profoundly deaf, is a member of the Mexican deaf community, which according to recent census data, includes close to 600,000 individuals. He is also the founder of SEVIDA, an initiative contributing to the education and social inclusion of people with hearing impairments. 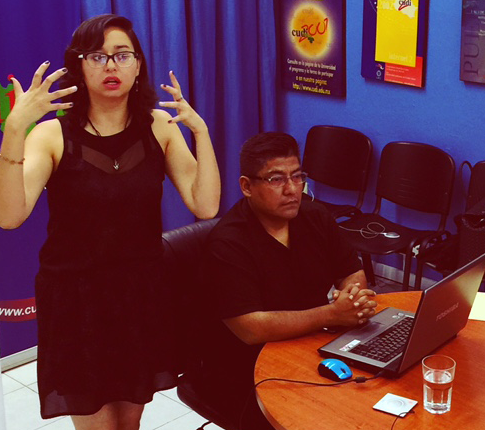 SEVIDA (SEminarios VIrtuales de Discapacidad Auditiva), is a series of virtual seminars hosted and recorded using the video conferencing platform VC-CUDI, provided by the Mexican research and education network CUDI. According to Jorge Santiago Jacinto, advances in technology have opened up a world of opportunities for education and the social inclusion of people with hearing impairments. After approaching CUDI for support, Jacinto succeeded in arranging a series of seminars, bringing diverse research groups, linguistic experts, health professionals and leading educators together once a month to share ideas, exchange knowledge and participate in training from anywhere in the world. Seminar topics range from the linguistic and cultural diversity in the Mexican deaf community to language development of children with hearing loss and workforce inclusion of deaf professionals. In this way SEVIDA is a unique seminar series of its kind, promoting a greater understanding of deaf culture, linguistics, the use of multiple sign languages and the importance of the interpreter – all from an international perspective. This a great example of how research and education networks provide the infrastructure to support collaboration and education and build cross-disciplinary communities of practice that transform the lives of individuals. View the SEVIDA seminar recordings.